We are happy that all eggs finally hatched and now we have all the remaining babies. Their names are: Delta, Epsilon, Zeta, Eta and Theta. Delta (hatched 9-8-2013) Delta hatched as a strong, healthy baby with very calm demeanor. He is very easy to handle and gets along with other babies rather well. I would say, he is very tame right out of the egg. He also has a unique feature: one asymmetrical dot right above his right shoulder. It is a very distinctive feature that makes it easy to identify him from other babies. Check out current updates on Delta here. Delta became very popular baby because of his tame behavior and was spoken for at the very early day. Now he happily resides with his new great family in Arizona. We are hoping to stay in touch and see how well he or she develops. Epsilon (hatched 9-8-2013) Epsilon had a very distinctive behavior when he hatched. 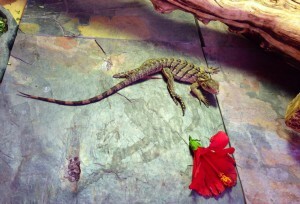 This Rock Iguana introduced himself to us with the style and some attitude! When he hatched from the egg and was being extracted from the egg incubation container he decided to greet us with the open mouth and very distinctive hissing. So, the temporary name Epsssssilon suits him very well. Check out current updates on Epsilon here. He is a very good looking baby with grey colors. 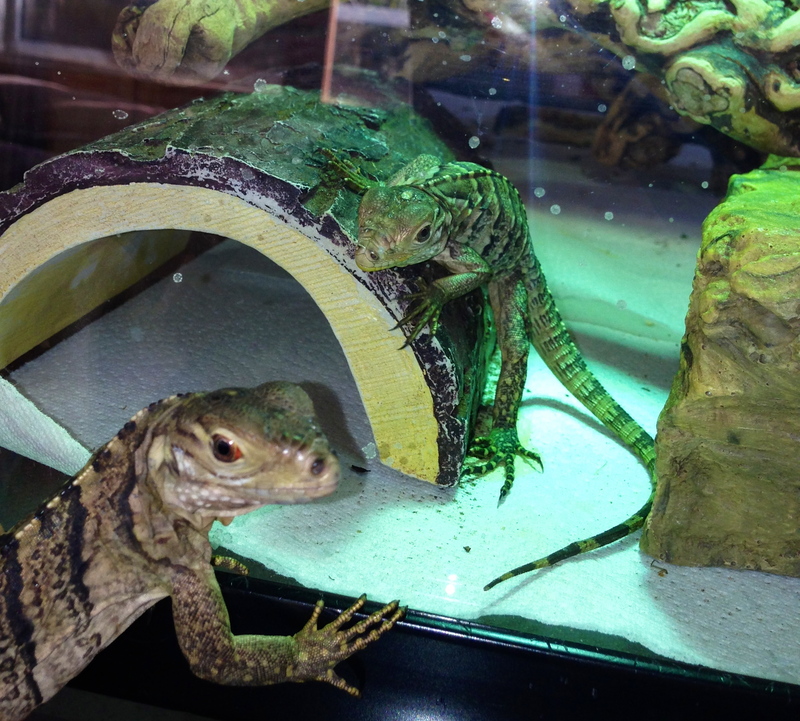 When Epsilon was couple weeks old he decided to become a dominant iguana and establish his authority among other babies. He tries to contest the territory and shows off his hissing skills. However, he doesn’t show the same attitude towards humans. He knows that we are bigger than him and accepts handling rather well. Zeta (hatched 9-10-2013) Zeta is an escape artist! When he hatched inside the egg container in the incubator he managed to push the lid open and squeeze out of the container. When we came to collect him, Zeta was sitting on the top of the container lid, looking through the window of the incubator, checking out the world. So, watch out for his “lizard” skills! He is a very strong and big baby. 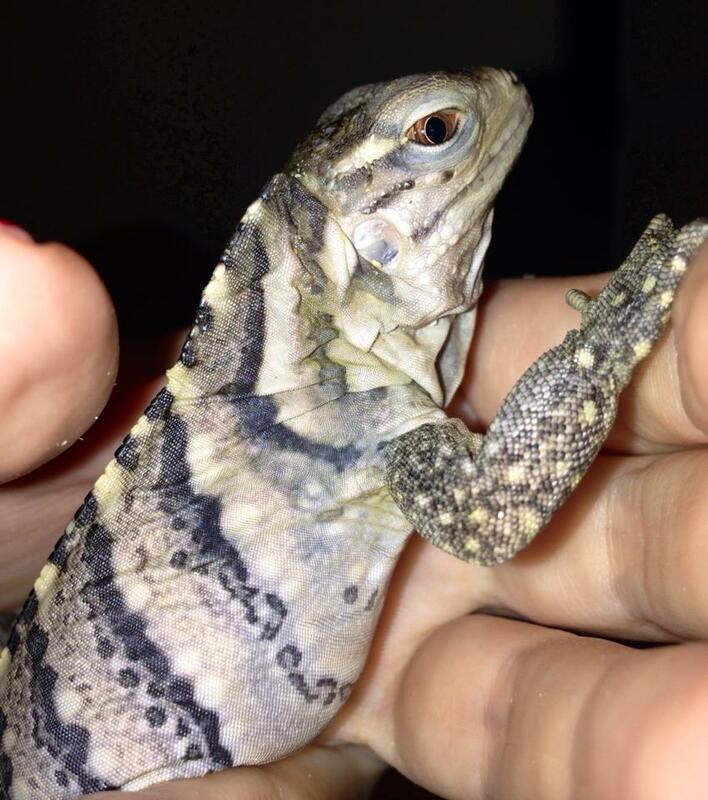 He has a very active personality, very cautious, curious, but not nervous. 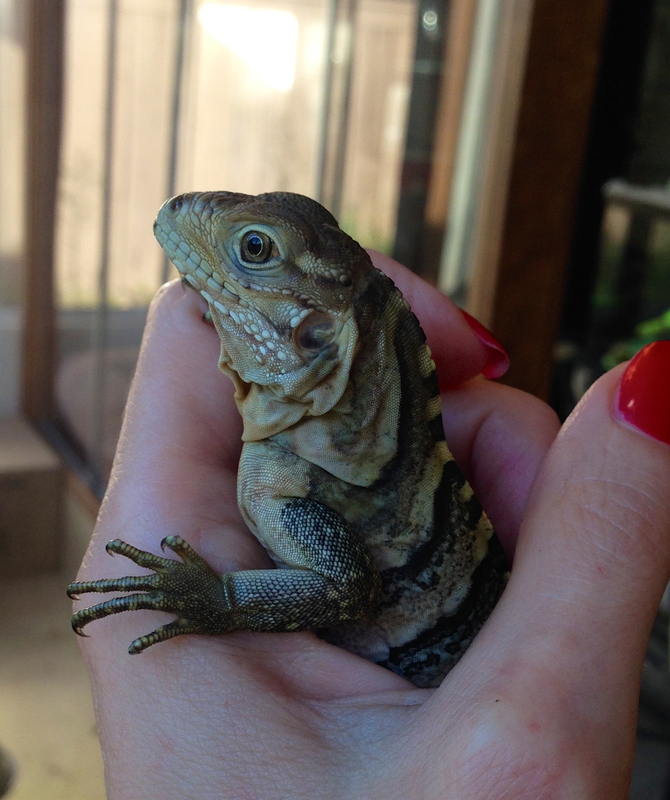 When you handle him, Zeta settles down into in your hand rather quickly and relaxes. Check out current updates on Zeta here. He gets along well with other babies and likes to scamper around. He also has a very unique pattern on the lower right side belly where the line is in a shape of zig-zag. Eta (hatched 9-12-2013) Eta is a very energetic baby who likes to scamper and run around looking for escape roots from the cage. But he settles down and chills through the day. Check out current updates on Eta here. What’s interesting, one day Eta was pacing the enclosure and clearly wanted to get out. So I reached out and picked him up and let him sit on my hand. He assumed perching position on my arm and just sat there freely for several minutes. Then he decided to crawl up my arm into my shoulder and perch there for another 10 minutes. He was very satisfied with his location at the time and calmed down nicely. This tells me that he should be good with people and handling and should be a tame iguana pet. Theta (hatched 9-12-2013) Theta is exhibiting strong confident and dominant behavior. When he came out of the egg he was ready hit the ground running with full speed. He is a big baby and enjoys being out in the open. He stands out with his presence and he is not shy to bob or hiss at other babies if he doesn’t get what he wants. However he is still easy to handle and he accepts petting and taming. I think he just wants to be the center of attention. Check out current updates on Theta here.